The Youth Advisory Council has been working, the past few months, on various projects for Freedoms Foundation. 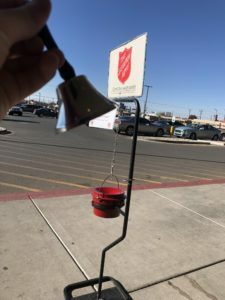 During the holiday season, myself and a few other Student Council officers decided we were going to volunteer at our local supermarket and ring the bell for The Salvation Army. We did this for about a week, off and on during our winter break. 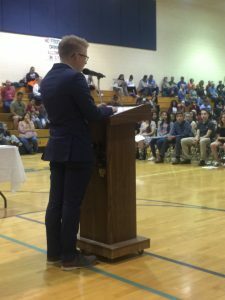 Bo addressed the Mountain View Middle School’s National Junior Honor Society at their induction ceremony. Read his speech here. 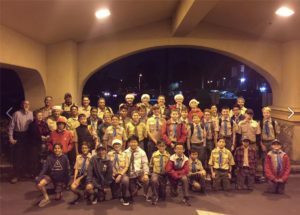 It is the annual tradition of Boy Scout Troop 412, located in Fountain Valley, to go to Manor Care, a nursing home, and sing Christmas songs. It was a family event, so it was not restricted to just the members of Troop 412. In addition, the scouts covered three floors of Manor Care and sang for the patients, as well as their visiting family members. The boys were very enthusiastic to spread holiday cheer to the less fortunate. Afterwards, the scouts and parents went back to do a gift exchange and white elephant, respectively. I wanted to do service that would directly benefit people in my school. 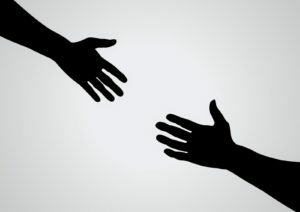 While I love to do service for people in other countries, states, or communities, sometimes I think the people that could benefit from my service the most are right in my own school. I decided to start a mentorship program. This program will be for a few select sophomores, and it will consist of a meeting once a month from January to May, free ACT prep , and continual mentorship from me for the next 3 years. I want to provide these select sophomores with the tools and resources I wish I would have known about when I was their age. I want to provide these students with a contact who can tell them the ins and outs of the college admissions process. And above all, I want to be someone they can look up to. Our first group meeting will be Tuesday, January 23 and we will be having a panel of Seniors there for a Q and A , an administrator will come and speak, and then I will be giving a general overview of the program. In the first few weeks of february I will be meeting with each of the 10 sophomores in the program to help them make goals and get to know them as individuals. My service project has been ongoing at my school, Desert Springs Christian Academy, for the past few weeks. In Las Cruces there is a pregnancy assistance center called “Turning Point” that works to aid pregnant women on their journeys to motherhood. The help they offer ranges from supplying prenatal vitamins and conducting exams to offering general emotional support. The women that Turning Point assists come from all backgrounds. I reached out to them asking in what ways I could help assist them in their efforts and they told me that acquiring more funding is there biggest goal. In order to do this I decided to do a simple yet exciting fundraiser at my school. The fundraiser consists of placing three large jars, each with a picture of a current high school student (including myself). Throughout a three week period students at the school would place money in each of the jars and at the end of three weeks, the student with the most money in his jar would get a pie smashed into his face in front of the entire student body. It does sound cruel however; we are on track to raise over $500. Freedoms Foundation YAC member Derek has been busy in Florida! He attended the Children’s Week Awards Dinner and a Kiwanis Advocates for Kids breakfast, the latter of which generated funding for Health Families Florida, a nonprofit organization which identifies, funds and evaluates innovative programs for children. Derek also took part in the “Hanging of the Hands” event which is an annual event where volunteers hang hands made by elementary and middle school aged students in the Capitol rotunda in order to have a larger push for funding for different children geared programs. In the month of January, I have been working on making homemade dog toys for the San Diego Baja Dog Rescue, which is a no-kill animal shelter in San Diego County. 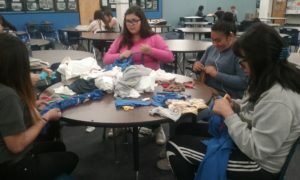 Since, I am President of my school’s Key Club, an international student-led community service organization, I encouraged members to bring and collect old t-shirts, in which we made the toys after school on the 19th of January. I also had some students make the toys at home to bring them in later on. We were able to make over 150 toys within one week! To me, this was a great experience because I was able to find a creative way to give back to our furry friends and to spread awareness about the Baja Dog Rescue. I was also able to encourage more students and teachers to adopt instead of buying dogs from pet stores, which are usually not good for the animals. I also taught students a little something about recycling and that you can make new things out of old items. Hello! My name is Gabby Marz, and I live in Sandy, Utah. This past December, I along with my fellow Student Government members, were able to plan, organize, and implement a local service project. There is a local Middle School with a high percentage of students on free or reduced lunch. As such, when these students go home during the Christmas break, they often do not have the same access to food that they do while attending school. So in direct combat to this, Student Government coordinated with the Latinos in Action (LIA) organization at Jordan High School to help the students. To do so, we had a fundraiser at our school, and with the money raised, we were able to purchase a variety of food. Once the food was purchased, Student Government and LIA went to the school to assemble bags of food. 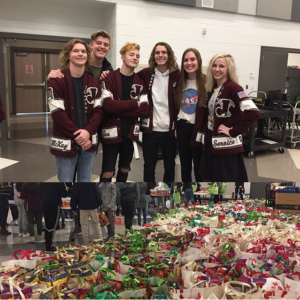 In the end, we were able to assemble over 900 bags of food items to give to the students right before the Christmas break. It was fantastic to see the collaboration of individuals to help those in need. There are differences being made right here in Sandy, Utah. My service project was teaching refugees how to speak English. In my history class we talked about current events that caused an influx in refugees in the United States. This caused me to learn that there was a large amount of refugees living North Carolina. I did more research and learned about a church nearby that helped refugees living in my community. A couple friends and I got together and asked how we could help them. This led to us helping teach the refugees how to read and speak English. Every other week we would go to a local library and read picture books to them and play games that would help improve their English. It is really amazing to see how much they have improved in the last two months. At first they were not able to speak or understand any English but now they are able to have conversations with us. The pictures at the bottom are of a Christmas party we had the week before Christmas. We gave out presents to the kids, such as bookbags and toys, and taught them how to play twister. It’s that time of the year again! In the spirit of the holidays, I have decided to gather up a few of my friends and give back to the community. We were able to partner up with the our local Tourism and Recreation services and came to help the annual speed stacking regional competition hosted by the WSSA. 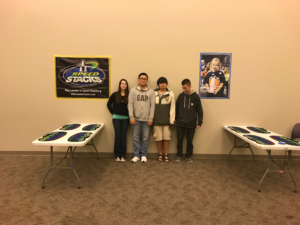 They needed people to set up the premises for the various speed stacking events, to judge the actual competition, and to help clean up after the events. We had a really fun time helping to put up posters, setting up judging tables, and getting to meet the supervisors and sponsors of the event. There was also another volunteer group from another local high school helping out the event, we have a fun time talk to each other and respected each other in the spirit of giving back to the community with our services. Overall, it was an unforgettable experience that has reinforced our idea of helping out the people and our community as a whole, and all of us had a grand time doing our services.